Copyright © 2013 Nipul K. Tanna, Marjorie K. Jeffcoat. This is an open access article distributed under the Creative Commons Attribution License, which permits unrestricted use, distribution, and reproduction in any medium, provided the original work is properly cited. Introduction: The primary objective of this study was to determine whether risedronate sodium (Actonel®) therapy, in conjunction with conventional non-surgical periodontal treatment, reduces the rate of alveolar bone loss. Secondary aims were to compare the incidence of patient dropouts in the risedronate and placebo groups, and to document adverse events. Methods: This double-blind randomized placebo-controlled trial was conducted in 125 patients with moderate to severe periodontitis. At baseline, three, and nine months, standardized vertical bite-wing radiographs were taken and used to measure bone loss. Clinical periodontal examinations were taken at three-month intervals to assess whether or not the patient was experiencing rapid periodontal breakdown, in which case suitable treatment could be planned and delivered. Patients received scaling and root planing at baseline and periodontal maintenance at three-month intervals thereafter. At three months, subjects were randomly assigned to risedronate (35 mg/week by mouth) or placebo in blocks based on the severity of periodontitis (moderate, mean bone loss 2 - 4 mm; or severe, mean bone loss >4 mm); smoking; and diabetes. Interval bone loss in millimeters was measured from the radiographs, and analysis of variance (ANOVA) was used to test for differences in bone loss between test and placebo groups. 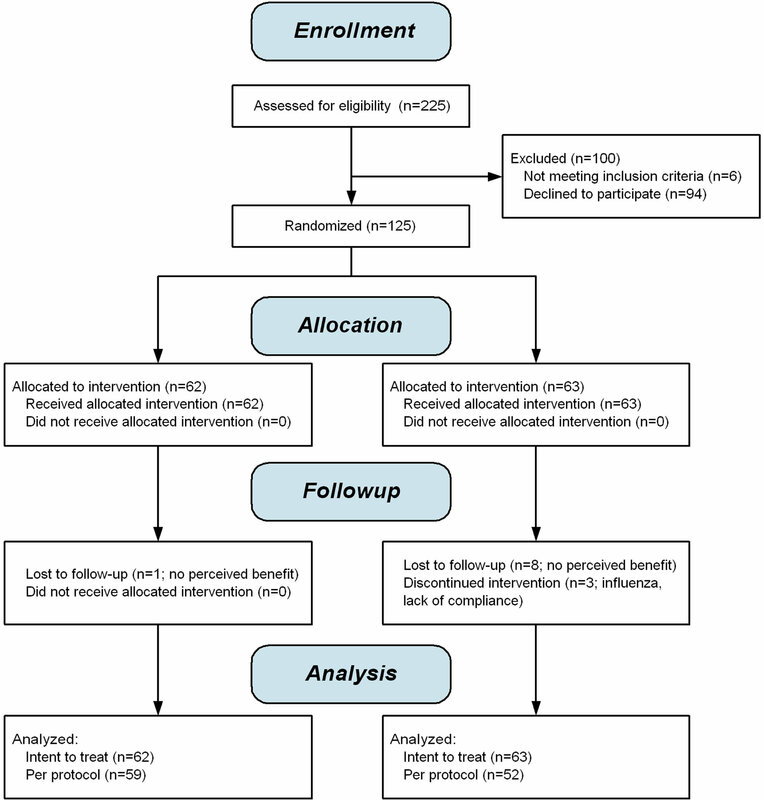 Results: Over the ninemonth study duration, the test group exhibited a significantly greater increase in bone height (0.31 ± 0.09 mm gain test, 0.08 ± 0.09 mm gain placebo, F = 4.94, p < 0.04). There were significantly fewer dropouts in the risedronate treated group (4.8%) than in the placebo treated group (17.5%; p < 0.04, Fisher Exact Test). No serious adverse events or cases of osteonecrosis of the jaw (ONJ) were observed. Conclusions: Periodontitis subjects treated with risedronate had significantly more bone gain compared to placebo treated subjects. Significantly more subjects from the placebo group dropped out, suggesting the possibility of a patient-noticeable effect. There was no indication of ONJ. Periodontitis is characterized by bone resorption and soft tissue destruction affecting the supporting tissues surrounding the roots of the teeth. Untreated periodontitis results in progressive bone resorption along the root surface, which can lead to abscesses and tooth loss. Periodontal diseases are initiated by a bacterial infection, but are modified by host response factors, including factors that modulate bone remodeling. It has long been hypothesized that oral bone loss may be related to systemic conditions predisposing the patient to osteoporosis or osteopenia. Several common risk factors are well established . While relatively few studies have assessed the usefulness of bisphosphonates to treat bone loss in the oral cavity, preliminary trials in animals have indicated that systemically administered bisphosphonates have a bonesparing effect in periodontitis [2-4]. Studies have shown positive effects on both alveolar bone height and density when alendronate sodium—another bisphosphonate—was administered orally in doses on the order of 70 mg per week over a 6-month treatment period [4-7]. The largest randomized, placebo-controlled study of an oral bisphosphonate was performed in a multicenter study in 335 patients with periodontal disease. It showed that alendronate had a significant effect in improving bone height among patients with low mandibular BMD at baseline . Several cases of osteonecrosis of the jaw (ONJ) have been reported to regulatory agencies following treatment with high-dose bisphosphonates, especially in cancer patients treated parenterally, and in the presence of additional risk factors, such as chemotherapy, glucocorticoids, and poor oral hygiene [9-16]. In the aforementioned study  of 335 patients, treatment with alendronate was not associated with a higher incidence of complications secondary to dental procedures, and no cases of osteonecrosis of the jaw were observed. The incidence of tooth loss was decreased more than 40% in the patients treated with oral alendronate. Compare the incidence of reported adverse events in the treated and placebo groups. Compare the incidence of dropouts (i.e., voluntary withdrawals from the study) between the treated and placebo groups. A randomized, double-masked, placebo-controlled study was conducted in patients with chronic periodontitis. After giving informed consent, patients received a periodontal examination including standardized vertical bitewings. Radiographs were taken at baseline, three, and nine months. The periodontal examinations were used to determine if the patients were undergoing rapid loss of attachment between examinations. If so, the patient was offered treatment of the affected site(s). Each patient was followed for the duration of the study. Upon study completion, patients could request a consultation with referral for further treatment if necessary. This study was approved by the University of Pennsylvania Institutional Review Board and was conducted according to the US Food and Drug Administration guidelines for Good Clinical Practice. All study patients gave informed consent in writing. 125 subjects with moderate to severe periodontitis were recruited. Figure 1 is a CONSORT 2010 flow diagram illustrating the disposition of subjects. Any other condition making it inadvisable for the patient to participate in the study. Conventional therapy consisted of full-mouth scaling and root planing (SRP) and oral hygiene and plaque control instruction at the baseline visit, and periodontal maintenance visits at 3-month intervals thereafter. The maintenance visits included reinforcement of oral hygiene instructions, supragingival and subgingival SRP as neededand removal of supragingival plaque and stain by coronal polishing. Standardized vertical bite-wings were exposed, scanned, and digitized. The radiographic operator was masked as to the group assignment (bisphosphonate or placebo). In each patient, a minimum of three and a maximum of eight interproximal sites were selected depending on the inclusion and exclusion criteria. For inclusion, interproximal sites of posterior teeth had to be clearly visible on sequentially taken bite-wing radiographs and interproximal sites had the two adjacent teeth present. Exclusion criteria were inability to clearly define a region of interest and/or unreadable films due to technical problems. The quantitative radiographic analysis is based on subtraction radiography, with certain refinements to improve the accuracy and repeatability of alveolar bone measurements. After scaling, alignment, and subtraction, the difference image is mathematically eroded and dilated so as to isolate and bound area(s) of bone change while eliminating most of the “noise” present in the subtraction image. The area of bone change is superimposed on the original radiograph as a visual check that the region of change is anatomically reasonable. The change in alveolar bone height is accomplished by mathematically projecting the region of bony change on the root surface. Clinical periodontal measurements were performed on six surfaces of each tooth (mesio-buccal, buccal, distobuccal, mesio-lingual, lingual, and disto-lingual) at baseline, six, and nine months. Periodontal measurements included: clinical attachment level in millimeters, probing pocket depth in millimeters, bleeding on probing (scored as 0 for no bleeding and 2 for bleeding present). The clinical measures served as a safety assessment so the investigator would be aware if the patient was undergoing rapid progression of periodontal disease. Descriptive statistics were used to describe the test and placebo groups. Analysis of variance was used to test for significance differences in bone height. Nonparametric tests, including Fisher exact test and chi square, were used to determine whether or not there were significant differences in the incidence of patient dropouts in the risedronate and placebo groups (Statistica, StatSoft Inc., Tulsa, OK, USA). A statistically significant improvement in bone height was observed favoring the risedronate group over placebo at 9 months (p < 0.04). The magnitude of the mean difference was 0.30 mm at six months and 0.19 mm at nine months (Figure 2). There were no serious adverse events, nor was there a pattern of adverse events in the risedronate group when compared to the placebo group. No evidence of osteonecrosis of the jaws was observed. We did follow up with the seven patients who received tooth extractions, and found no evidence of osteonecrosis in that post-hoc analysis. Figure 2. Efficacy of Risedronate on improving alveolar bone loss. This study demonstrated the efficacy of bisphosphonates in improving outcomes of conventional non-surgical periodontal therapy. 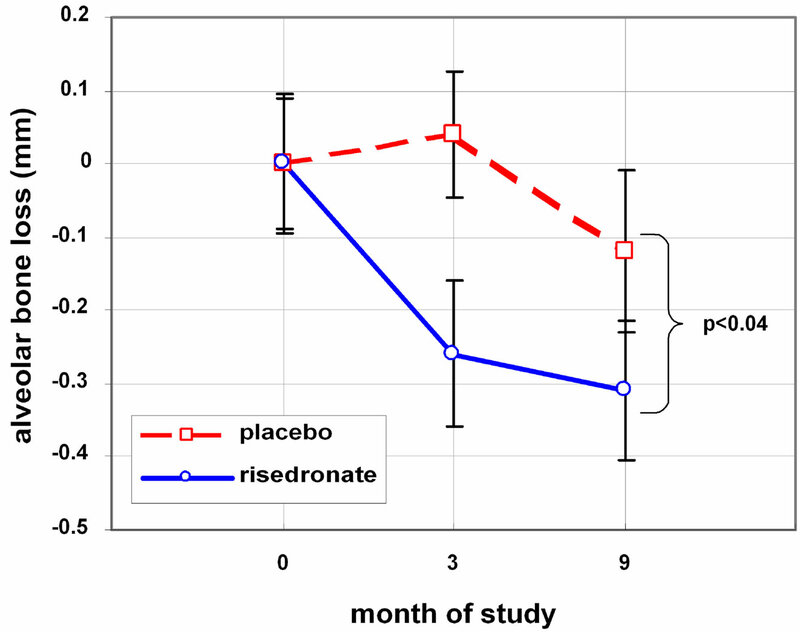 An additional, unexpected, and interesting finding was that there were significantly more dropouts in the placebo than the risedronate group, suggesting the possibility that the beneficial effect of the alendronate therapy may be noticeable by the patient without reference to quantitative clinical measures. The implications of these data are profound, touching upon an area of considerable current debate in the medical and scientific communities: whether, and under what circumstances, does oral bisphosphonate therapy expose the patient to the risk of ONJ. While the significant majority of cases of bisphosphonate-associated osteonecrosis of the jaw have been encountered in patients receiving intravenous bisphosphonate therapy, there have been some case reports [9-16] in which the patients received the drug orally. The findings of the present research suggest that there is benefit to oral bisphosphonate therapy in that it protects individuals against periodontal bone loss and osteoporosis. This correlates well with previous studies [17-21] that have indicated that osteoporotic individuals are at higher risk for alveolar bone loss, and that postmenopausal women with osteoporosis are likely to be missing a greater number of teeth than those with normal bone mineral density. The risk of osteonecrosis of the jaws has also been investigated using a different methodology by Pazianas et al., who did not find a relationship between bisphosphonates and ONJ . El-Shinnawi, U.M. and El-Tantawy, S.I. (2003) The effect of alendronate sodium on alveolar bone loss in periodontitis. Journal of the International Academy of Periodontology, 5, 5-10. Jeffcoat, M.K., Cizza, G., Shi, J., Genco, R. and Lombardi, A. (2007) Efficacy of bisphospho­nates for the control of alveolar bone loss in periodontitis. Journal of the International Academy of Periodontology, 9, 70-76. Ruggiero, S.L., Mehrotra, B., Rosenberg, T.J. and Engroff, S.L. (2003) Osteonecrosis of the jaws associated with the use of bisphosphonates: A review of 63 cases. Journal of Oral and Maxillofacial Surgery, 61, 1238-1239. Markiewicz, M.R., Margarone, J.E., Campbell, J.H. and Aguirre, A. (2005) Bisphosphonate-associated osteonecrosis of the jaws: A review of current knowledge. The Journal of the American Dental Association, 136, 1669- 1674. Jeffcoat, M.K. (2006) Safety of oral bisphos­phonates: Controlled studies on alveolar bone. The International Journal of Oral & Maxillofacial Implants, 21, 349-353. Jeffcoat, M.K. (2011) Viewpoint on osteonecrosis of the jaw. Medscape. Skrepnek, G.H., Seal, B., Tangirala, M., Jeffcoat, M.K., Watts, N.B. and Hay, J.W. (2010) Adverse events and intravenous versus oral bisphosphonate use in patients with osteoporosis and cancer in the US. General Dentistry, 58, 484-492. *This research was supported by the Foundation for Better Bone Health. The authors state that they have no conflicts of interest related to this research.